The earliest encounter between native Mayans and Spanish explorers can be traced back to 1502. As Christopher Columbus undertook the exploration of the Americas, he sent his brother to explore the adjoining lands. His brother, Bartholomew Columbus, encounter a Mayan canoe and looted it. Hernandez de Cordoba then took a large expedition to the Yucatan Peninsula where he met Mayans, looted some cities but returned without any fateful successes. It was later under the command of Pedro de Alvarado that the Spanish directly assaulted Mayans lands and after a protracted war, conquered them. Hernandez de Cordoba then took a large expedition to the Yucatan Peninsula where he met Mayans, looted some cities but returned without any fateful successes. In 1517, Spanish explorer Hernandez de Cordoba reached Yucatan with a small fleet of ships. He tried to reach a nearby Mayan city was but his troops were ambushed and many Spanish lost their lives in the attack. The Spanish later looted the town and found gold items in the temples. After being forced to retreat from most Mayan regions, the Spanish explorers frantically searched for fresh water. In this search, Cordoba’s troops were surrounded by a large Mayan army. In the final decisive battle, Spanish lost more than fifty men and were forced to retreat from the Yucatan region, making their way back to Cuba. In 1518, following on the reports of the Cordoba expedition, Cuban governor Velazquez sent his nephew Juan de Grijalva to further explore the Yucatan region. Grijalva reached the Mayan island state of Cozumel with a fleet of four ships. He wasn’t able to effectively communicate with the local Mayans and travelled along the peninsula, putting in at a number of Mayan cities. He later met some local Mayans and learnt from them of the rich Aztec Empire. Grijalva returned with his fleet without any major success on his explorations but with the significant news of the Aztec Empire, which informed the expedition of Hernan Cortes. Hernan Cortes reached the Cozumel Island in 1519 and immediately took control of the island. He then travelled to the Mayan town of Potonchan. Mayans readied for battle but Cortes had a large number of horses and troops who defeated the Mayans without any major difficulty. Cortes then went on to conquer the Aztec Empire and ended the Aztec reign by 1521. As Cortes gained control of the vast Aztec Empire, he began receiving envoys from different Mayan lands, professing allegiance to the Spanish. Following the reports of Mayan rebellions in different areas of Soconusco, Cortes sent Pedro de Alvarado with a sizable army to quell the rebels. Pedro’s army comprised of 300 infantry, 180 cavalry, 4 cannons and a large body of native warriors from formerly Aztec regions. Within a year, Alvarado subdued any opposition to the Spanish crown in the Soconusco region. He then proceeded to the Mayan Highlands in an attempt to subdue Mayans of the modern-day Guatemala. In 1524, Hernan Cortes took a large expedition to Honduras. This expedition comprised of 140 Spaniards, 3000 Mexican warriors, horses and artillery. He reached the Mayan territory in Tabasco where he was able to get the support of the local Mayans and with their help, continued his journey to Kejache territory where the Itza Mayan reigned. Cortes met the Itza King who was awed by the priests accompanying Cortes. He accepted the Christian faith, gave up the Mayan religion and forged an alliance with the Spanish. Cortes then made a hazardous journey through the Mayan Mountains before reaching back Mexico. After subduing rebellious Maya in the Soconusco region, Alvarado marched on with his army to the Mayan Highlands in what is modern-day Guatemala. He had to confront the might of the Kiche Mayan who had established a kingdom in this region. Alvarado fought first proper battle with the Kiche Maya at Xetulul where they defeated the Maya and took control of the town. He was involved with a number of other conflicts with the Kiceh Maya, defeating them in all of their territories. 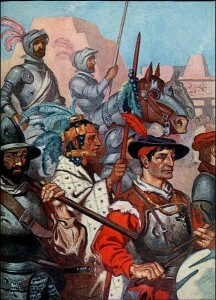 Finally, the Spanish army and their allies were pitted against a 30,000-strong army of the Kiche Mayas in February 1524. The Maya army was routed probably due to the invaders superior western weapons and this conclusively established the Spanish control of the Kiche kingdom. The Mayans of the Chiapas Highlands were relatively remote from the conquests of the Spanish until 1524. In 1524, a reconnaissance party under Luis Marin was sent to explore the region and its inhabitants. He was involved in many conflicts with the Chiapas Mayans but none proved fruitful and Marin’s men didn’t achieve any significant results. This was followed by Alvarado’s expedition of the region in 1525. Like Marin before him, he had to face fierce opposition. And although he defeated the local inhabitants in many conflicts, the expedition didn’t yield any significant results. Alvarado led his army to the capital of the Mayan kingdom of Poqomam. Here he had to face fierce opposition at the city of Mixco Viejo. The Spanish first tried to storm the city in repeated attempts but were forced back. The battle was then fought on open land outside the city. After fierce fighting that lasted nearly the entire day, the Spanish side stood victorious. The Spanish were then able to storm the city, capture the inhabitants. The city itself was burned and the inhabitants relocated to a colonial settlement. The Spanish exploration of the Mayan regions began in 1502 when Christopher Columbus’ brother came across a Mayan canoe and looted it. More detailed exploration was undertaken by Hernandez de Cordoba in 1517, who engaged the Mayans along Yucatan Peninsula. Some of these engagements proved hostile and Cordoba was forced to retreat. Later, Cuban governor’s nephew Juan de Grijalva undertook expedition to the Mayan regions. He was able to gather information about the Aztec Empire but didn’t achieve any success on Mayan lands. Later, Hernan Cortes brought down the Aztec Empire in 1521. He dispatched Pedro de Alvarado to subdue most of the Mayan lands while himself undertaking many campaigns against rebellious Mayas.